A&D Transport Services, Inc. was founded in 1994 by Alan R. Rubin and David A. Freed. Graduates of SUNY Oneonta, they quickly recognized a need for a delivery service within the Oneonta community. World Is Yours delivery service was the initial business and provided the community with a prompt and reliable delivery service for a variety of goods. As the needs and demands of the community grew, the company grew. In 1996, in support of the STOP DWI initiative, Alan and David reinvested into their company and established a taxi service, A&D Taxi. By 1998, their fleet of vehicles grew tremendously, postioning A&D Transport Services, Inc. to partner with various local, regional, and state agencies. In 2000 as a result of their continual investment. A&D Transport Services, Inc. established the area’s first locally owned courier service. 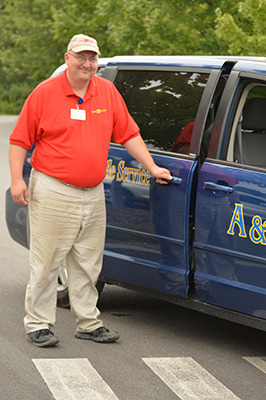 A&D Transport Services, Inc. has grown to successfully provide transport services to Central NY and the Southern Tier over the last 20 years. Continued collaborations with a broad range of customers transporting a variety of commodities and goods has enabled various partnerships for providing its continued success. We thank you for, as we strive to continually improve and expand our orginization to serve our community. We also now have wheelchair accessible van and can provide service in the following counties: Otsego, Delaware, Chenango, Cortland, Herkimer, Oneida, Madison and Montgomery.